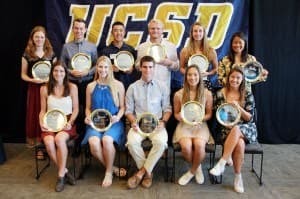 This past Tuesday was National STUDENT-Athlete Day, and the UCSD Department of Intercollegiate Athletics recognized 12 outstanding Tritons at the event near RIMAC Arena. Created in 1987, National STUDENT-Athlete Day honors college student-athletes who have achieved excellence in both academics and athletics, combined with outstanding contributions to their schools and communities. The UCSD Guardian had the chance to interview two of the honorees, and we also congratulate the 10 others who were acknowledged for their achievements. Caitlin Brenton is a senior majoring in economics with a 3.92 GPA. – CCAA academic accolades and Provost Honors in her two years as a Triton. UCSD Guardian: As a student athlete, you get a lot of benefits that a regular student doesn’t. What’s the biggest benefit of doing a sport, and how do you take advantage of this? Caitlin: At UCSD, we don’t really get the huge benefits like athletes at bigger schools — we don’t get a lot of scholarship money or cool gear. We’re all here because we love what we do. We’re in it for the experience and the friendships we’ll gain. I wouldn’t trade it for the world. G: What is the best advice you have for future student-athletes? D: The best advice I have is to come in with an open mind and take advantage of everything you can. When you come to college, it’s time to work as a team and support your fellow athletes. Supporting each other just boosts your friendships. C: Plan your schedule out in advance so you’re not surprised at the end when you see how many units you have left. On another note, though, you have to come in ready to work — you may have been a star in high school, but this is a different level of competition. 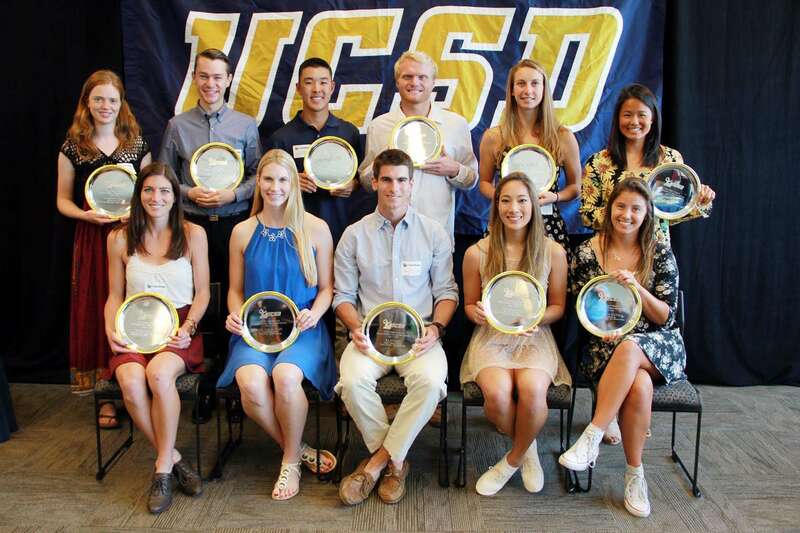 G: What are the best memories you have from your time as a student-athlete at UCSD? C: Road trips with the team were always fun. I remember our trip to Humboldt: Our bus driver was new and the bus broke down, so my dad had to drive back and forth between the hotel and Humboldt to get our team to the game on time. Honestly, though, it’s all those crazy things that happen with your team that become memories you’ll never forget. D: I definitely agree. All the crazy things that happen when traveling make the best memories. We have a tournament every year in Chicago in February, and it’s always so cold — there’s so much snow! That was the most fun, though; we’d be walking back from dinner and end up having an impromptu snowball fight, and, yeah, it’s cold and really wet, but it was so much fun. D: One thing I want regular students to know about student-athletes: We really aren’t that different. We work just as hard as everyone else — there is a big misconception that athletes have it easy. Especially here, we really have to work just as hard to stay afloat academically and athletically. We do have to work harder in the sense that we’re on the road a lot. We might have to take midterms on a plane ride or in a hotel room. You learn to manage your time really well. Anyone in any organization knows how that is. C: You really get the same spectrum of intelligence between athletes and non-athletes. For both athletes and non-athletes, there are people who may struggle to graduate, and then there are others whose biggest complaint is that an A+ won’t boost their GPA. Really, the only difference between us is that, for at least one quarter, if not more, we have 20-plus hours a week that we spend doing athletics that a normal student gets to do whatever they want. Karinne Caisse is a classical studies/anthropology junior with a 3.66 GPA. Nate Ford is a human biology senior with a 3.72 GPA. Michaela Kazek is a senior chemical engineering major with a 3.77 GPA. – played in all 20 matches in 2014, helping guide UCSD to a second-straight trip to both the CCAA and NCAA tournaments.